Hand Crafted in our workshop. Made from sustainably sourced timber (FSC/PEFC Certified). Reed & bead t & g backs. Widths 50/60/71 x Height 70 x Depth 23cm. Extra Large plate diameter up to 30cm. 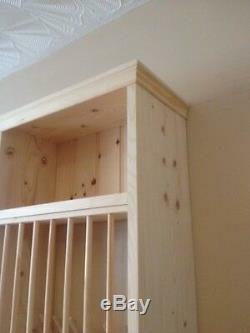 Can accommodate Large Pasta Bowls (dowel to dowel openings 4.3cm). Supplied with bevelled top Cornice (Traditional supplied upon request). Also supplied with wall mounting fixing/screws/plugs. Gorilla Glued Joints with pocket screw construction. Extremely strong for assured support! 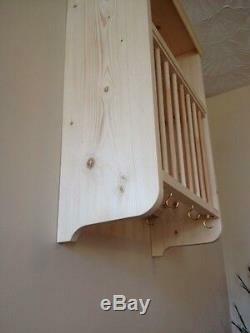 Made by Cabinet Maker (35 yrs). The company recognises its responsibility to the environment, the companys customers, suppliers and staff. We will base our commercial activities on sourcing. Products from certified, well-managed forests or from post-consumer recycled materials. Please message me if you have any questions or for any special requests. All external sizes can vary slightly... Please check first if going between walls & let us Know!! Traditional Wall Mounted Pine Storage Plate Rack" is in sale since Monday, April 3, 2017. This item is in the category "Home, Furniture & DIY\Cookware, Dining & Bar\Food & Kitchen Storage\Racks & Holders". The seller is "treefellas24" and is located in Nr Blackpool.